When homeowners do not have central air conditioning — or even if they do, but still have a room in their home that’s not quite cool enough — their first thought to surviving a heat wave is to install a window air conditioner. However, that may not be the best available option. Ductless split air conditioning systems are beginning to gain popularity as an alternative to traditional cooling. 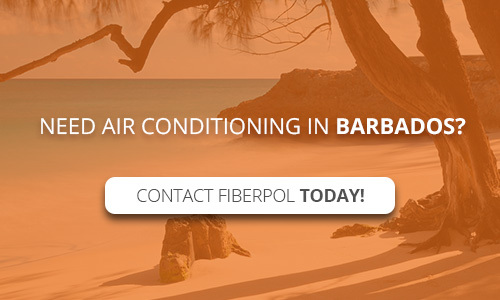 FiberPol Inc. can help keep the rooms in your home cool from the Barbados heat with ductless inverter technology air conditioning. Mini-split or ductless air conditioning systems, as the name suggests, requires no ductwork and is split into two components — an outdoor unit with a heat pump and an indoor air handling unit. The two components are connected by a small As the name suggests, the system requires no ductwork and is split into two components—an outdoor unit with a heat pump and an indoor air handler. The two are connected by a small channel of coolant, which absorbs the heat inside your home and releases it outside to help maintain a steady, comfortable temperature, one room at a time. Ductless air conditioning systems are the ideal system for individual rooms or small spaces. When compared to window air conditioning units, ductless air conditioners offering have the advantage and offer the following advantages. Unlike bulky, loud window air conditioning units that can cause your energy bills to spike, ductless air conditioning systems use up to 40 percent less energy by transferring heat energy rather than altering it. Unlike window units that block an entire window and deter light and fresh air from entering inside your home, a mini-split system can be placed modestly on a wall — out of the way, yet easily operated with a remote control. If you are wondering where to place a split air conditioner, check out one of our recent blogs. Sensors and an inverter technology air conditioner compressor allows a ductless system to work at varying speeds instead of just on and off settings for more consistent cooling. An air conditioning unit that sits in your window can be a target for thieves. Ductless systems, on the other hand, require only a three-inch that doesn’t compromise its security. 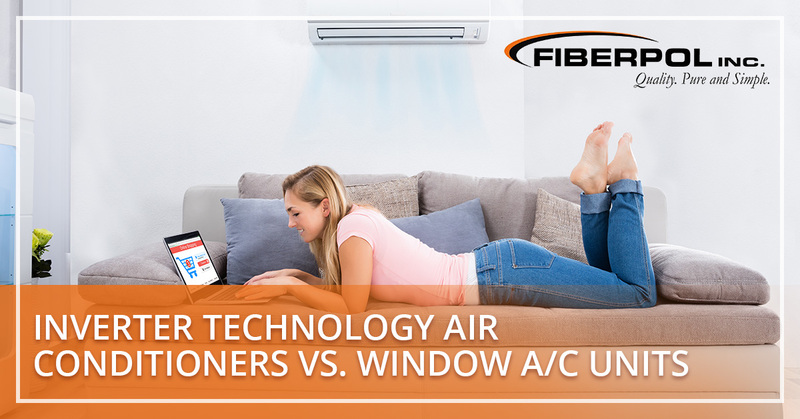 While min split air conditioning units make a little bit of noise, it is significantly quieter compared to the loud operation of a window air conditioner unit. Inverter air conditioner technology maintains precise control of room temperature and creates a comfortable living environment. In window A/C units, the compressor triggers on and off to adjust to the desired room temperature. This causes a fluctuation in the indoor temperature and reduces energy efficiency. With a ductless air conditioning unit, the power to the compressor is reduced rather than cut off and this provides enhanced control in maintaining the desired temperature. When you assistance with your cooling needs, always turn to the professionals at FiberPol. We are a Streamline Inverter Air Conditioner authorized dealer and have the cooling solutions you need to escape the Barbados heat. If you are interested in having a ductless air conditioning unit installed in your home, contact our team of air conditioning experts today.